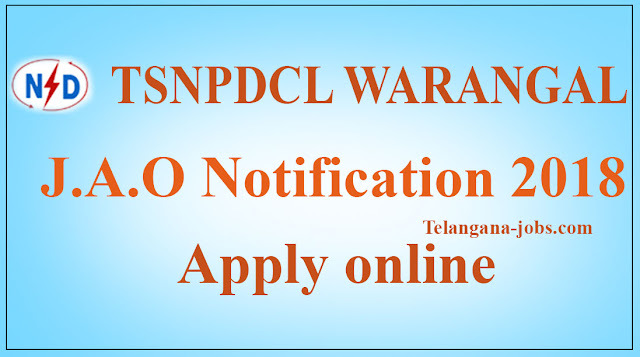 TSNPDCL JAO Notification Apply online. TSNPDCL Recruiting the Junior Accountant Officers number of vacancies 107 in all categories.Notification number 04/2018 Date 31-05-2018. Scedule of TSNPDCL JAO exams. Submit application start from 16-06-2018. Downloading of Hall tickets 13-07-2018. Minimum 18 to 44 years. Age relaxation: The upper age limit is prescribed above is relaxable p to 5 years in respect of SC/ST/BC candidates and up to 10 years in respect of physically handicapped candidates. Applicants must possess the qualifications from the a recognized institution / board as detailed below or equivalent thereto, as specified in the relevant rules of TSNPDCL as on the date of notification. Must possess B.Com 1st class/M.Com 1st class or pass in CA/ICWA inter from any recognized university in india. Applicants should have to pay must 100/- towards online application processing fee. After payment you should have to submit the application to complete the process of application submission. TSNPDCL announced a clear syllabus for the exam of JAO 2018 . This 100 marks devided in two sections. Accountancy & Advanced accountancy ( English) 35 Marks. Cost and Management accounting (English) 25 Marks. Relate to Telangana culture & movement. Below available reservation wise vacancies list.